Are you making plans to create your dream pool house? Maybe you’ve been going over some design ideas with a contractor. It’ll be a place where you, family members and friends can relax with a cold drink after a relaxing swim. You’ve incorporated a sitting area, a spacious counter and comfortable stools into the design so everyone has a place to hang out. However, no pool house or cabana roll up shutters design is complete without reliable roller shutters. Our custom-made pool house roller shutters are a must-have. 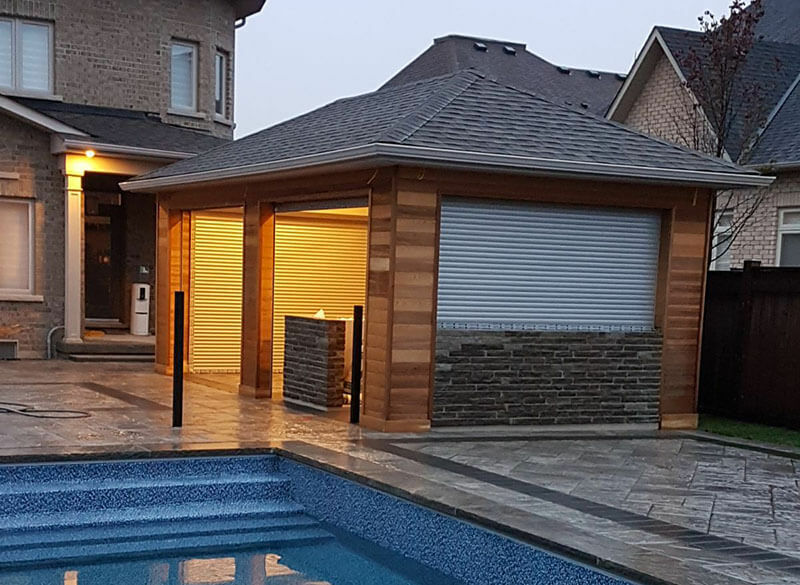 Look at a few reasons why so many homeowners in Canada turn to our company for pool house security in the form of custom-made shutters. Your furniture, rugs, dishware and artwork are just a few of the costly items inside your pool house or cabana roll up shutters in Toronto, ON. Our Toronto pool house roller shutters provide you with a high level security. Once you close the shutters for the evening or even for the cold weather season, you know anything left inside the pool house will be secure. This is especially desirable if you and your family leave home on a vacation for several weeks a year. Our pool house roller shutter doors are custom-made here in Canada! So, you can enjoy peace of mind about the quality of their construction. We sit down with you to discuss your needs and preferences. Then, we provide you with several options for roll up shutters that will provide you with pool house security and exceed all of your expectations! Our Toronto cabana shutters are easy to operate so you can raise or lower them without a problem. So, if the weather turns stormy or you have to leave your pool area for the day, you can close your shutters quickly and efficiently and be on your way. Plus, our shutters make it easy to close up your pool area for the season. Maybe you just purchased a home in Canada with a great pool in the backyard. The look of the pool house is part of what sold you on the home. But, the pool house security is lacking. Going with our roller shutters would be the perfect way to upgrade your pool house security and boost the visual appeal of the structure. Our custom-made roll up shutters are durable. This is essential for pool house security. They are constructed out of quality materials and made to be a solid barrier against trespassers, thieves, etc. Also, they can withstand the wind, rain and changing temperatures that occur throughout the year. So, you can leave items inside your pool house knowing that the roller shutters are on guard 24/7. Cleaning your pool house roller shutters is an easy process. After all, you want them to look their best even when your pool is closed for the season. Our experienced staff can explain the best approach to keeping your cabana roll up reception counters shutters looking great throughout the year. Everyone knows that roll up shutters are practical features on a pool house or cabana. But, that doesn’t mean they can’t be stylish as well. Our cabana shutters as well as our other shutters are visually attractive. You can have your shutters painted to enhance the look of other parts of the décor in your pool house. Or, you can choose a vinyl wrap for your cabana shutters giving them a sleek, finished look. Our roll up shutters can complement other colors or textures in your décor making your pool house a standout in the neighborhood! Maybe you want to give your cabana shutters a unique look. We can help you fulfill your creative vision for your roll up shutters or cabana shutters. What colors do you want to incorporate into the design? What images do you want to put on your roll up shutters? We want to do our part to assist you in getting exactly what you want for your pool house or other structure. Maybe you have a pool house or other structure with an unconventional shape or design. We can provide you with custom-made shutters that fit with the unusual design of the structure. In order to have pool house security or security for another type of structure, you must have shutters that fit with the design of the building. We are so confident about the quality of our cabana roll up reception counters, we provide customers with a five-year warranty. So, not only do you get first-rate pool house security, you get a warranty to back up the quality of our products! We are proud to say we’ve been in business for ten years and counting! We have earned a reputation for helping homeowners find the roll up shutters they’ve been dreaming of for better pool house security. Maybe after placing your order, you have a few additional questions about your shutters. You want to ask about another aspect of the pool house security they provide. Or, you want to know more about their construction. No matter the question, our knowledgeable staff members are here to help! We are happy to answer your questions to your satisfaction and make sure you are comfortable with your purchase. We want you to fully enjoy a renewed sense of pool house security. We invite you to contact us to let us know what your vision is for your pool house shutter doors. We are experts at working with homeowners to find the best option for their pool house or cabana. Let us provide you with the combination of visual appeal and pool house security you’ve been looking for!